Chicago Review Press, 9781613731307, 208pp. When it started, many thought the Great War would be a great adventure. Yet, as those who saw it up close learned, it was anything but. In the Fields and the Trenches traces the stories of eighteen young idealists swept into the brutal conflict, many of whom would go on to become well-known 20th-century figures in film, science, politics, literature, and business. Writer J. R. R. Tolkien was a signals officer with the British Expeditionary Force and fought at the Battle of the Somme. Scientist Irène Curie helped her mother, Marie, run twenty X-ray units for French field hospitals. Actor Buster Keaton left Hollywood after being drafted into the army’s 40th Infantry Division. And all four of Theodore Roosevelt’s sons—Kermit, Archibald, Quentin, and Theodore III—and his daughter Ethel served in Europe, though one did not return. 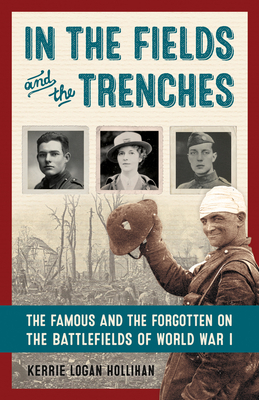 In the Fields and the Trenches chronicles the lives of heroes, cowards, comics, and villains—some famous, some not—who participated in this life-changing event. Extensive original material, from letters sent from the front to personal journals, brings these men and women back to life. And though their stories are a century old, they convey modern, universal themes of love, death, power, greed, courage, hate, fear, family, friendship, and sacrifice. Kerrie Logan Hollihan is the author of Reporting Under Fire, a Children's Book Council/National Council for the Social Studies Notable Trade Book for Young People. Among her other books are Rightfully Ours, Theodore Roosevelt for Kids, and Isaac Newton and Physics for Kids.